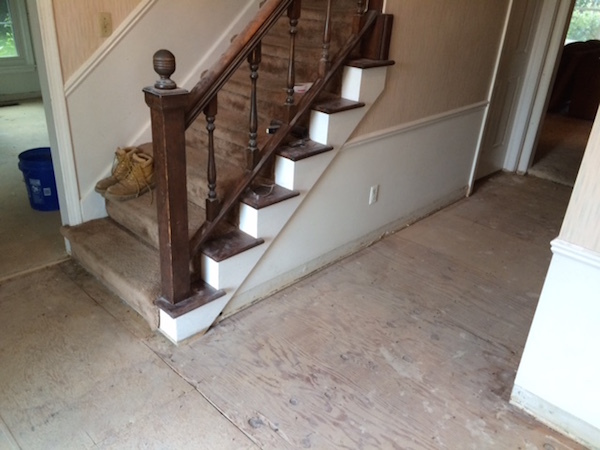 After passing through the rubble phase, we were left with a clean layer of plywood in the entryway. The remaining problem was this plywood the concrete was about 3/4 inch lower than the subfloor everywhere else in those house. We needed to have another layer of plywood on top to bring everything up to the same height. After getting the plywood very clean with the shop vac, David stapled cedar shims in bowed areas to help the floor be as level as possible. 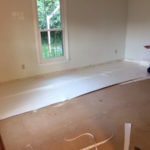 Then, we placed a layer of our underlayment on top of it, between the two layers of plywood. 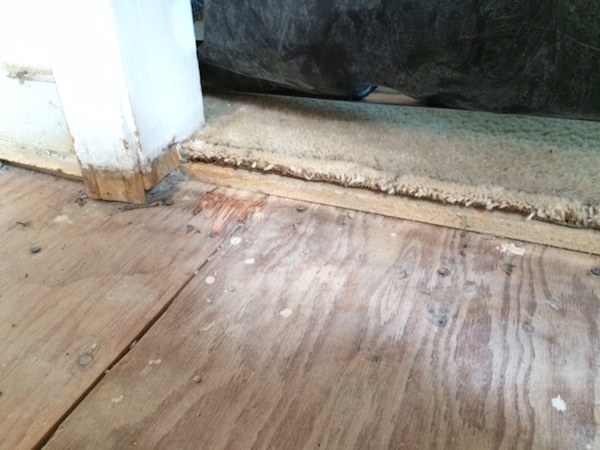 Wood on wood contact is when you can get squeaks in the floor, so the underlayment helps prevent this. Our entryway is about 110 square feet. 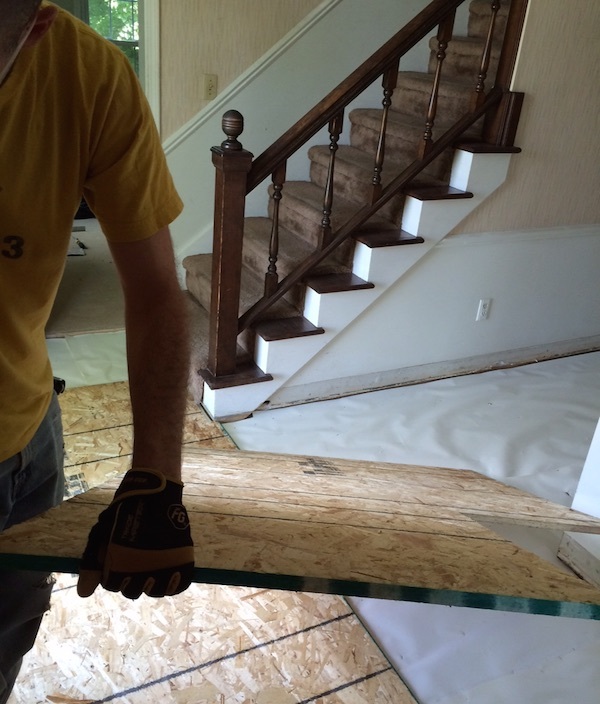 For the subfloor, we bought four 3/4 inch sheets of 4×8 foot OSB plywood for about $50. After trimming up the door jambs (to be trimmed even higher when we lay the hardwoods), David screwed the plywood into the joists. The process was measure, cut, drill, repeat. Bringing the pieces in was just like fitting a puzzle together. David found working with smaller pieces was much easier than trying to do big ones – especially when they have to maneuver around several corners. 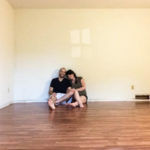 He was sure to always screw the boards through joists (sometimes going down to the basement to check) to further help prevent squeaky boards. Having wood seams meet at a joist so both boards can be screwed through it helps too. 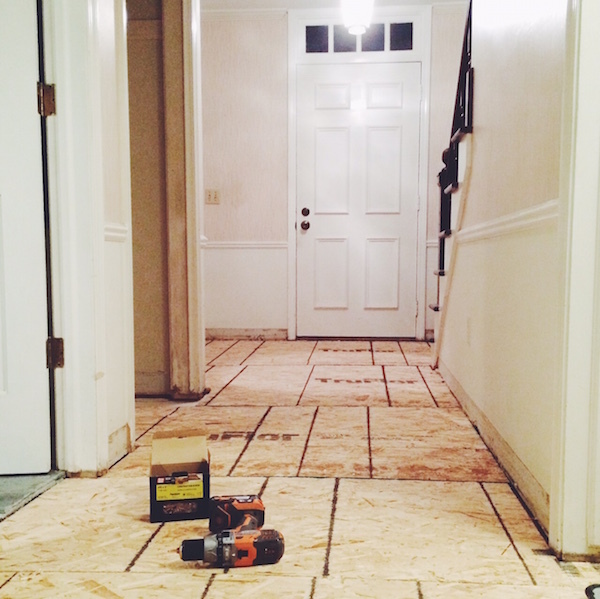 It took about two days to complete leveling the subfloor. 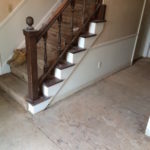 Since having to pass through a very dusty entry with shards of slate everywhere, smooth plywood to walk across feels downright luxurious by comparison. I can only imagine the glory of freshly laid hardwoods.